Someone's handiwork from 100 years ago, revealed again today. Beautiful. I love old houses. Oh me too! If those walls could talk. . .
Oh how wonderful. Our house is only 20 yrears old and I have seen morethan it's walls. What an amazing thing to find. Your house must be very old. I hope the surgery is going well. 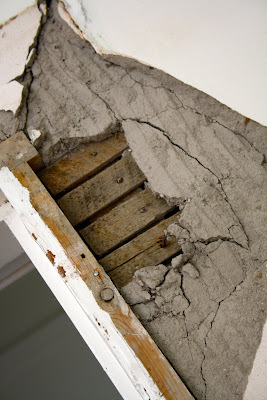 Ah snap - our house is about 120 years old and is also of the lath and plaster variety ... recently a plasterer was trying to convince us the way to go was to rip it all out and gyprock it ....mmm??? ?